Onkyo DS-A2X review | What Hi-Fi? The Onkyo DS-A2 was an Award-winning budget-choice cradle to connect an iPod to a sound system. This new model has an extra 'X' in its name, but some things are the same: the onscreen display and video playback using the composite out, and Onkyo's RI functionality for remote control sharing when using with another Onkyo product. If you're not connecting to another Onkyo, the 'A2X also comes with its own little remote. In action, the Onk' is a decent listen. As long as your digital music isn't too compressed, tunes are clear, well defined and generally well balanced. It does lack a little weight, occasionally introducing a touch of brightness - but given the budget price, we're prepared to be pretty forgiving. With the functional on-screen display and decent build, this is an excellent package. 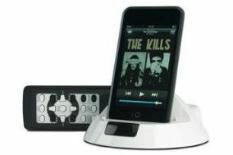 Onkyo still produces a fine budget dock.